Belarus visitor: Sr Anastasia Badeeff, from St Elisabeth’s Convent in Belarus, wasn’t expecting to be called by God. SR Anastasia Badeeff is expecting a chilly welcome when she returns home this week. She is a Sister of St Elisabeth’s Convent, Minsk, Belarus, a country of about 10 million people that borders Poland and Russia, and the climate there is a little different to that in Australia. “Belarus is a beautiful country with many forest and lakes,” she said. “It’s cold, in winter. It can be 35 degrees below zero but in the summer it can be 30 degrees; we have some extremes. “It is autumn there at the moment so it is raining, maybe snowing a little bit. Sr Anastasia has been in Australia for the past month on a fundraising mission for the ongoing community work of St Elisabeth’s Convent. “In Belarus, our main mission is to help sick and suffering people,” she said during a visit to Brisbane. Sr Anastasia said those people included children and adults with disabilities, women “escaping troubled situations” and those suffering addiction. “We have many missions to take care of and so that’s why we are here in Australia selling the articles that we and some of the people we help make in our convent,” she said. “In our country we don’t have any resources like oil; we have only human resources so people are hard-working and are also very tolerant, kind people. It’s not the first time the St Elisabeth’s Convent Sisters have visited Australia. “It started some years ago when several fellow St Elisabeth Sisters visited some of Australia’s Orthodox parishes,” Sr Anastasia said. She said the sisters were surprised not only by the climate and the native wildlife but also liked the Australian people who were generous so they asked the Archbishop of Melbourne if they could visit the following year. “We were very welcome and we enjoyed our trip so last year we came to Melbourne and also to Sydney but this is the first year we have visited Brisbane and the second year I have made the trip,” Sr Anastasia said. The convent has more than 300 sisters and just over a third of them are contemplative sisters who live in the convent. Thirty-year-old Sr Anastasia is one of “around 200 active St Elisabeth’s Sisters who live in Minsk in small communities and travel to the convent or hospitals each day to help with the community work”. She said a religious vocation was not her first career choice. “In Belarus you don’t have any Catholic schools; all schools are government schools, (and) they are free and most universities are free. Sr Anastasia said she was 23 when she first encountered St Elisabeth’s Convent. “It was God’s call,” she said. Sr Anastasia said she was also drawn to the spirituality of St Elisabeth’s Convent. “A friend took me to one meeting with our spiritual father, Fr Andrew and he was talking about our real life and the sense of this life and I was thinking about our mission on this earth and I was very encouraged by what he was talking about and I joined to help the sisters,” she said. Sr Anastasia said she was also inspired by the life of the convent’s patron saint, St Elisabeth. Sr Anastasia said St Elisabeth, was a granddaughter of Queen Victoria and founded the Martha and Mary community after the death of her husband, the Grand Prince of Russia Sergey Alexandrovich who died at the hand of the communists. “She sold all her possessions to found the community in Moscow and this community gains its inspiration from Mary’s capacity to listen to Christ’s Word and Martha’s duty to help others in need,” she said. She said in the early days of the community, sisters took care of wounded soldiers and street children. “It was a very hard period in Russian history as it was the beginning of our First World War and a Russian revolution,” she said. Sr Anastasia said St Elisabeth was a wonderful woman with an open heart and a deep spiritual life. She and the rest of the Russian royal family were killed by the communists. “Her body was taken by the priest of her community and the coffin was in Jerusalem after one month travelling around China because of the communists,” Sr Anastasia said. 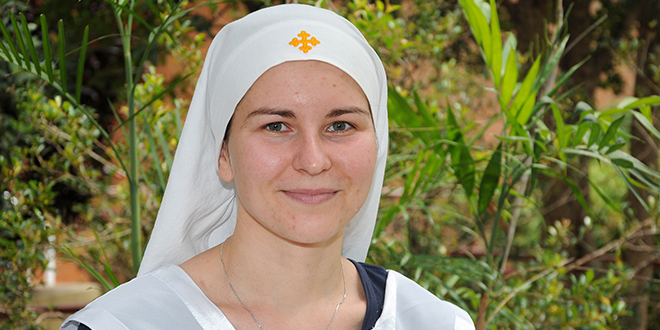 Sr Anastasia was born in Russia “because my father worked at that moment near St Petersburg, but when it was the collapse of the USSR we came back to Belarus and almost the whole (extended) family is now in Belarus”. She said the country was “a good neighbour”. “We have many refugees in our country now because of some troubles in the Ukraine but we are very welcoming to anyone who comes to our country,” she said. While in Australia Sr Anastasia and a colleague visited Parramatta, Broken Bay and Brisbane dioceses and she was grateful for the welcome received in each of them. “Every day we are visiting different parishes to share (information) about our community,” she said.